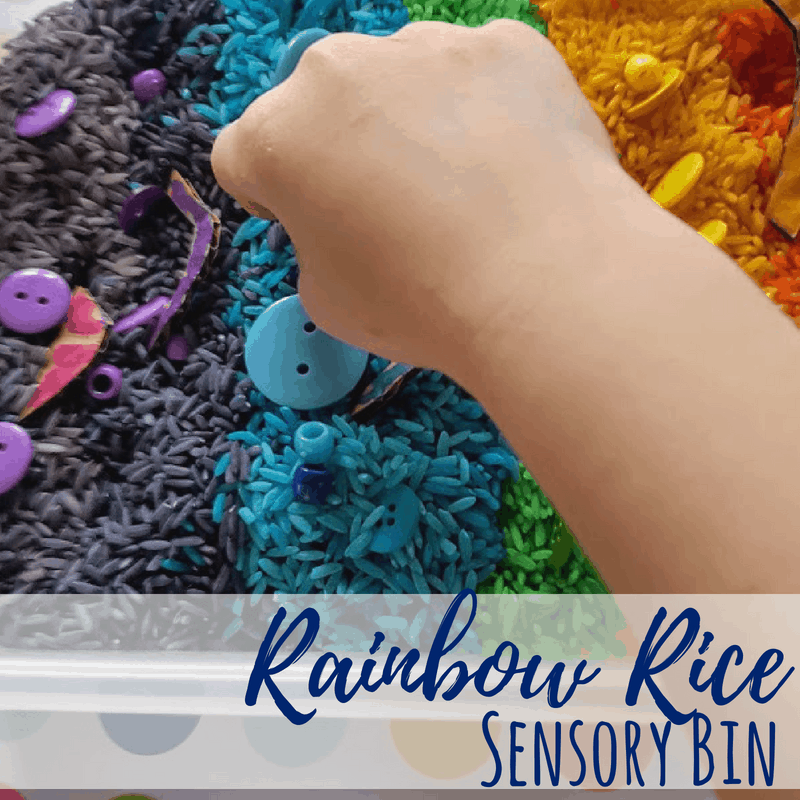 A rainbow rice sensory bin for all ages! 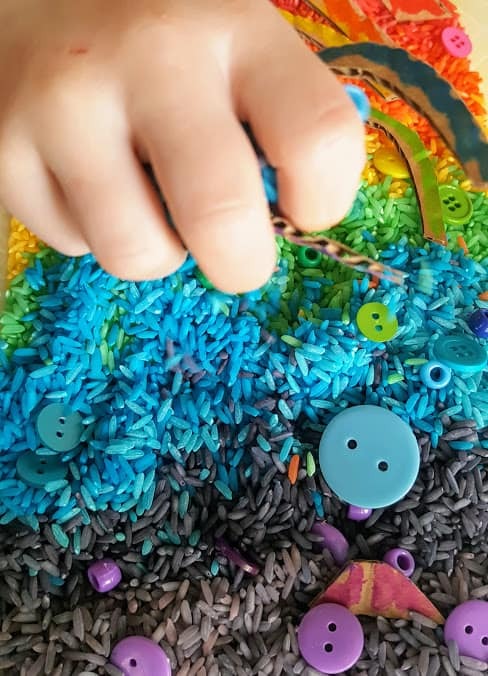 Fine motor skill practice and sensory play with a homemade rainbow puzzle kids will love. 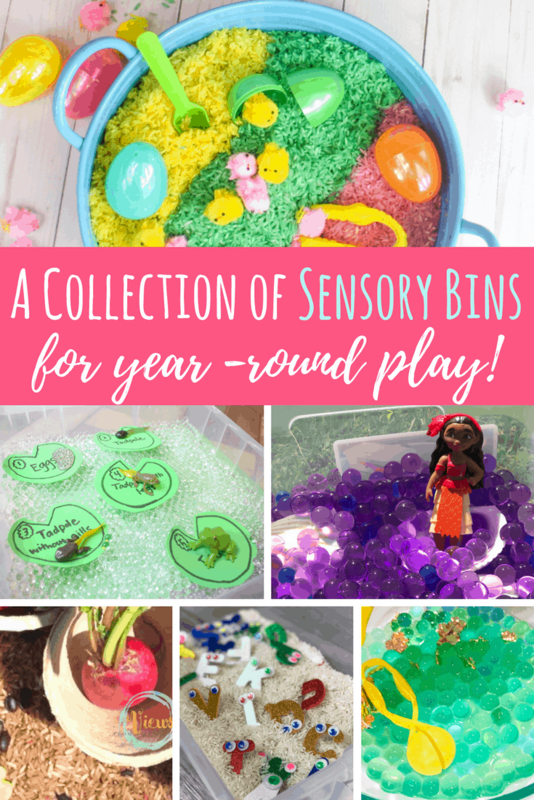 Sensory bins are so much fun for kids! 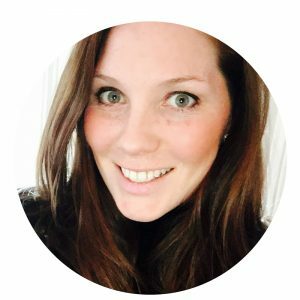 What a great way to introduce a concept or a new skill. Kids learn so much better when all senses are engaged. 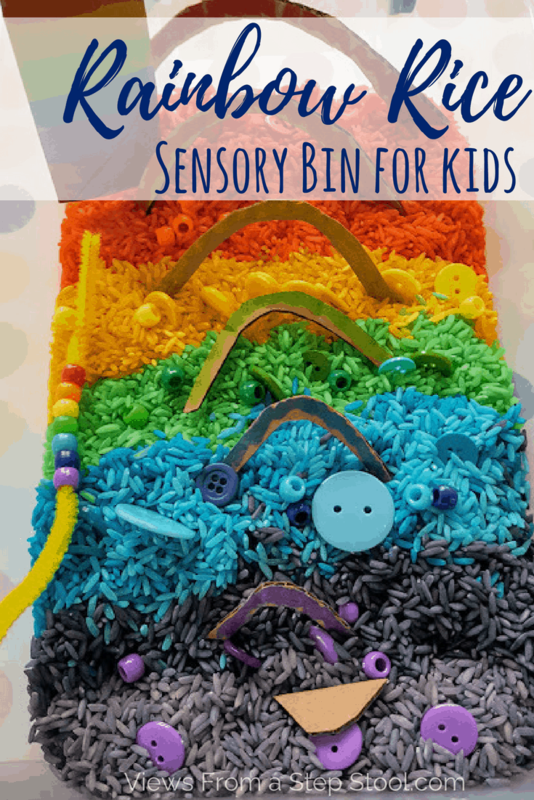 This rainbow rice sensory bin is great for the Spring or for year-round play. 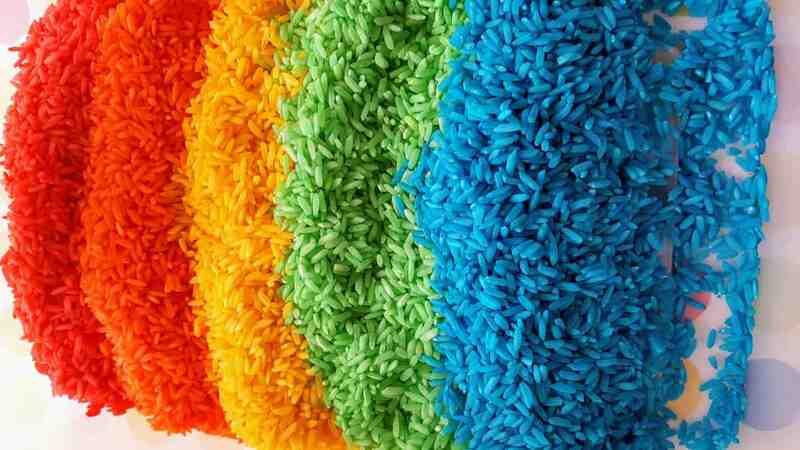 Did you know you can buy rainbow rice? See where below. Or simply make your own. Either way, the kids will love it! Plus, check out how to incorporate fine motor skill practice into your sensory play. 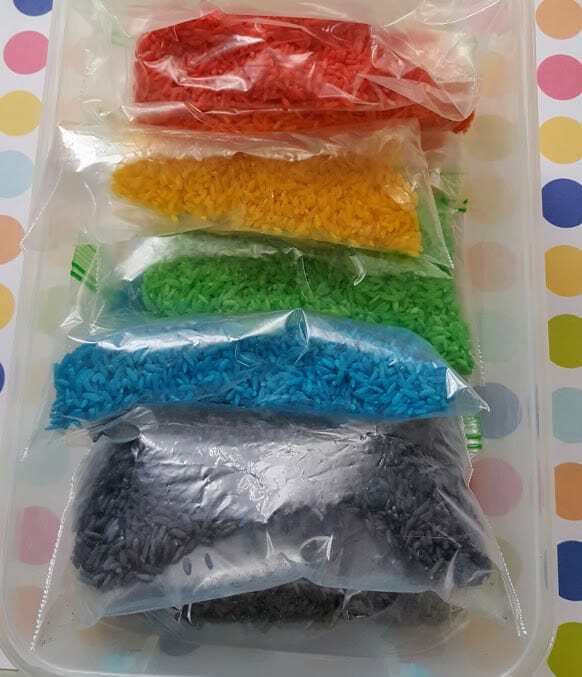 We love to make materials such as dyed rice, colored beans, and colored pasta as sensory bin bases. 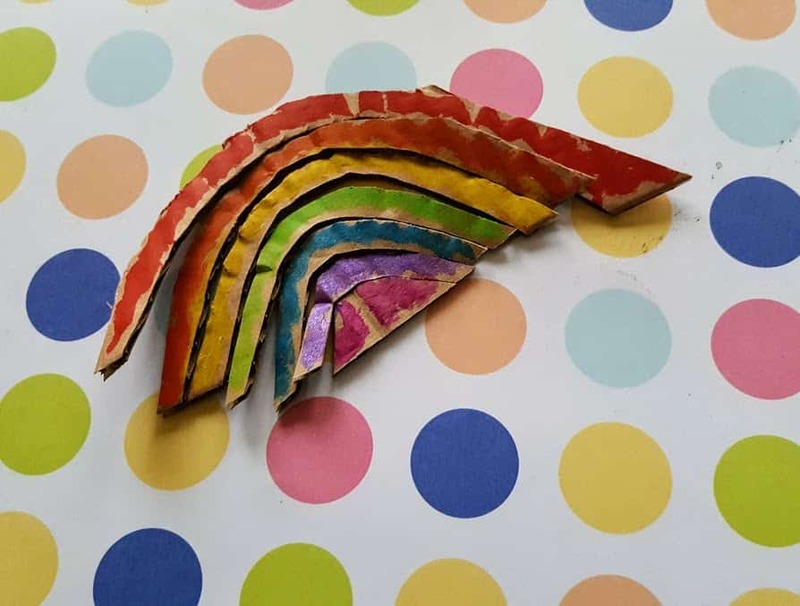 Cut a rainbow shape from the cardboard; I used a half of an oval shape about 6” long and 4” high. 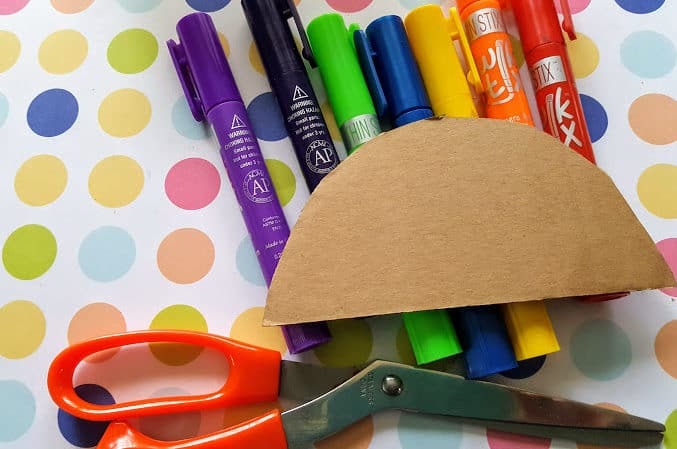 Cut that cardboard rainbow form into 7 sections. Cut the sections with the shape of the rainbow, so that they will fit back together. This forms a simple puzzle for little hands to explore. Color or paint the sections of cut cardboard to represent the colors of the rainbow; red, orange, yellow, green, blue, indigo and violet. 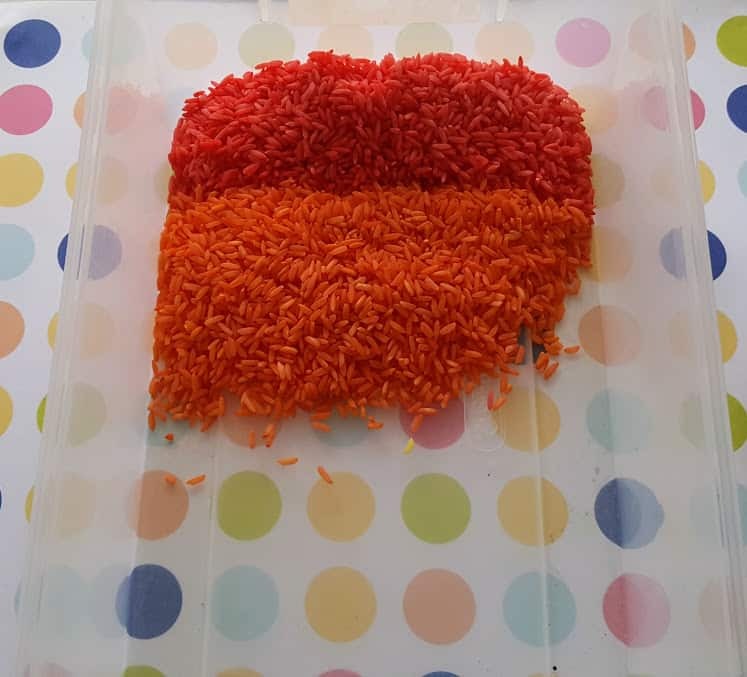 There are a couple of ways you can make this rice – you can purchase the rice already pre-dyed and ready for play here (which is what we did in this post), or you can buy plain white rice and dye it yourself at home (check out this post to see how). 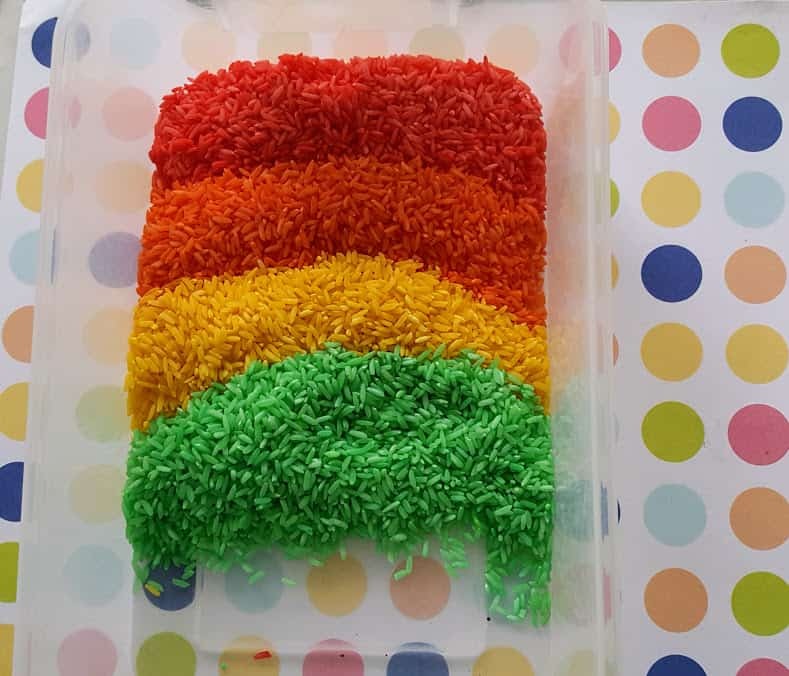 Layer the rice in the colors of the rainbow in the box; red, orange, yellow, green, blue, indigo and violet. 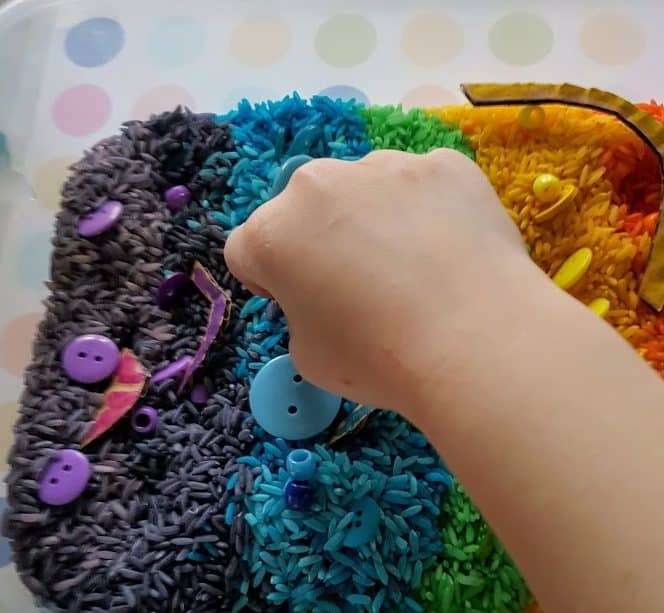 As you have your rainbow base down begin add beads to the rice base. 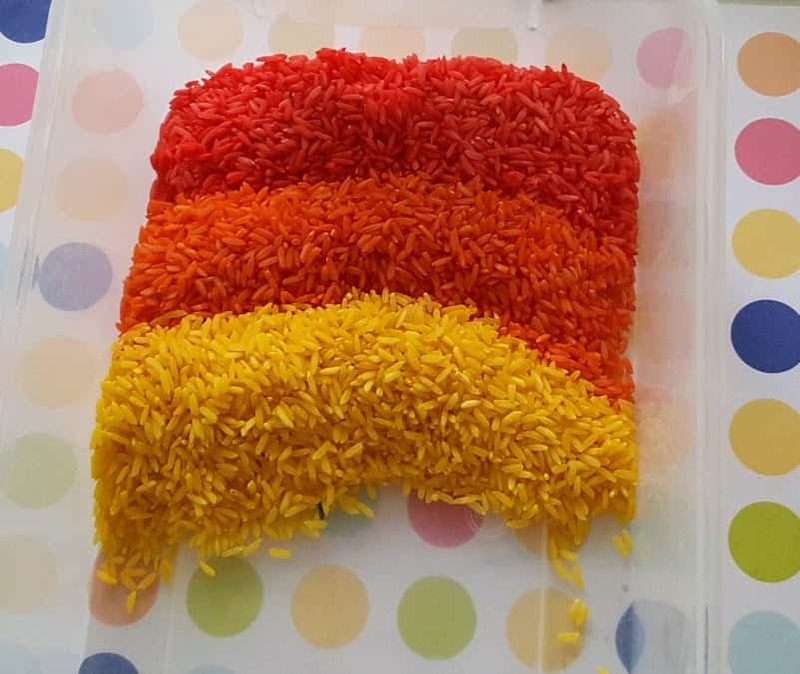 Nestle the rainbow puzzle sections into the coordinating color of rice. Add a pipe cleaner or two. Add a sandbox tool, kitchen spoon or tongs to offer new ways to explore! 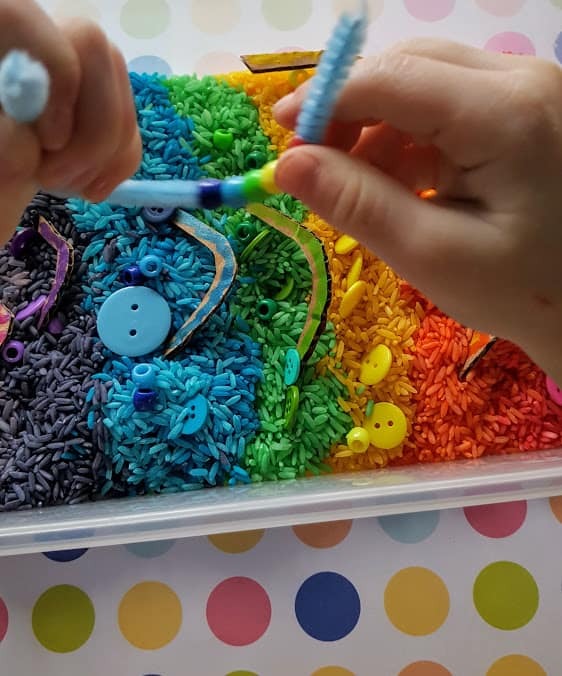 With supervision, invite your child to explore the colors of the rainbow, to thread the beads onto the pipe cleaners and to build the rainbow puzzle. When playtime is over, you can snap the lid on the box to store for future play sessions, this will keep for quite some time like this! While the children are naturally going to mix the colors together, that is okay! The next time they explore this sensory bin, they can work on their sorting skills! 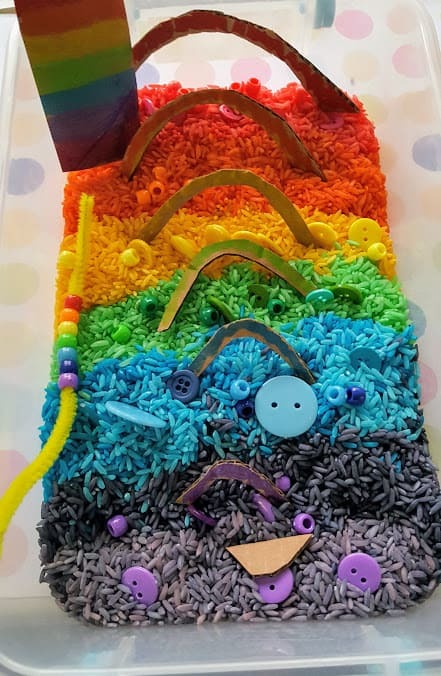 Enjoy playing with this rainbow rice sensory bin, check out this page for the ultimate collection of our favorite sensory bins on this site!